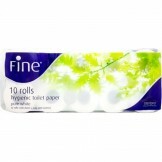 These Fine Tissue Rolls are here to keep your hygiene intact. They are popular for being super soft and good absorbers, therefore, get these tissue papers and lead a clean and a healthy life. Currently available on Dawaai.pk; an online pharmacy in Pakistan with the lowest prices and free delivery (terms & conditions apply). Offering the Fine Tissue Rolls with fast shipping in Karachi, Lahore, Islamabad, Quetta, Peshawar, Rawalpindi and many other cities of Pakistan.